Domestic geothermal heating and cooling systems tend to be expensive – for example ground source heat pumps, and air source heat pumps. However, it is possible to make something yourself very inexpensively with the potential to make a significant reduction in your heating or cooling bills. In this article we will look at the most basic of system which can be used to heat or cool a shed or greenhouse. While the air temperature changes significantly in most places with the passing of the seasons, the temperature of the ground stays relatively constant. For example, if you dig down to a depth of just 4 feet (1.2 metres) in the UK, the temperature of the ground will maintain a relatively constant 8-11 degrees Celcius (equal to the average annual air temperature). In the winter when it is -5 degrees Celcius at the surface, at a depth of 4 feet the ground will be 8-11 degrees Celcius; and in the summer when it is 25 degrees Celcius at the surface, at a depth of 4 feet the ground will still be at 8-11 degrees Celcius! Therefore, in the winter we can exploit the relatively warm ground for free heating, and in the summer we can exploit the relatively cool ground for free cooling. Let’s say that we have a shed in the garden which is unpleasantly hot in the summer and freezing cold in the winter. Our first course of action would be to insulate the roof, walls, and floor of the shed so that it doesn’t get really hot in the summer or really cold in the winter, and also seal it tight against draughts. Then we are ready to set up the ‘geothermal’ system. 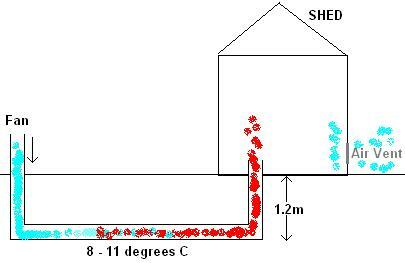 Pictured above is a very rough and simplistic schematic of geothermal shed heating. A pipe is laid at a depth of 1.2 metres or more in the ground, with an inlet coming out of the ground outside the shed and an outlet coming up through the floor of the shed. A fan fitted to the inlet outside the shed blows cold ambient temperature air down and through the pipe where it is heated by the 8-11 degree C ground. It emerges through the floor of the shed warmer than when it entered the pipe rising into the shed and displacing the cold air already in the shed through the air vent located low in wall of the shed. In order for this to work, a differential temperature thermostat is required to control the fan so that it only turns on when the temperature of the air in the pipe is warmer than the temperature of the air in the shed. The longer the run of underground pipe the better since it means the air has a longer journey during which it can absorb heat energy from the ground surrounding the pipe. With the pipe in place, a fanneeds to be selected which has enough power to push the air all the way through the pipe but not so much power that it blasts through the pipe without heating up. The fan can be powered by a 12V battery charged by a PV Solar Panel to give full renewable energy heating. To cool the shed in the summer, the air vent needs to be moved to the apex of the roof. (Hot) air is blown down the pipe by the fan, cooled by the ground, and emerges at the floor level of the shed displacing the shed’s hot air out through the air vent. In this configuration the differential temperature controller needs to run the fan whenever the air temperature in the pipe is cooler than the air in the shed – easily achieved by swapping over the two temperature sensors. The system described above for shed heating and cooling and be expanded for whole house heating and cooling if the pipe runs are long enough and the fans strong enough. See our articles Make Your Own Air Conditioner and Make a Simple Solar Air Heater for further DIY renewable heating and cooling options. It is vital to fit insect filters over the inlet and outlet of the pipe to keep out insects, rodents, bits of leaves etc. 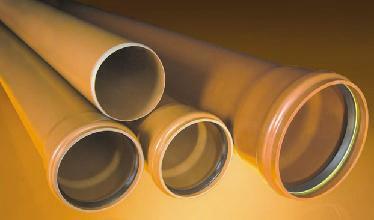 Condensation can build up on the internal surfaces of the pipe as hot summer air blows through the relatively cold pipe. In order to prevent mould growth, the pipe should be laid not quite level with small holes drilled through the pipe at the low point of the pipe run for the drops of condensation to collect and escape. Dig a hole under the pipe run low point and fill it with sand or gravel to ensure speedy drainage. Standard 4 inch (10cm) PVC soil pipe works well for this type of system as it is cheap, sturdy, widely available, and a good selection of 4 inch soil pipe fittings are available to help you to build a pipe run of maximum length in a small area – for example snaking under the garden. It also enables a standard 12VDC 4 inch fan to be used.